Nick Jonas – Going on 2010 Tour! Burbank, CA – Nick Jonas (of the Grammy-nominated and multi-platinum selling Jonas Brothers) & The Administration announced tour dates for their upcoming tour. The dates kick off January 2, 2010 in Dallas at House of Blues and wind up January 30 in Berkeley, CA at Zellerbach Auditorium. The shows will be intimate in their setting, reflecting the more raw and powerful feel of their upcoming album, Who I Am, which is due out February 2 on Hollywood Records. Tickets are set to go on sale starting December 5 on LiveNation.com in select cities with fan club presale access beginning tomorrow. 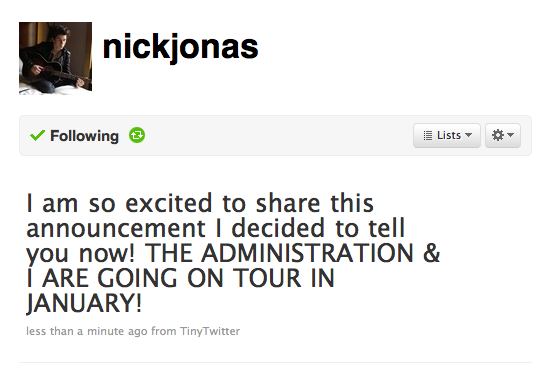 Visit www.nickjonasandtheadministration.com for more ticket details. Earlier this year, Nick flew to Nashville’s Blackbird Studios with 3 years worth of song ideas not quite right for the Jonas Brothers, and recorded his side project, Who I Am. He enlisted producer John Fields, and they quickly pulled together an “A-Team” of musicians, which they gave the moniker “The Administration.” The Administration is made up of some of the world’s most accomplished musicians. John Fields plays bass, and he’s joined by drummer Michael Bland and keyboardist Tommy Barbarella, both of whom played in the New Power Generation. Though guitarist David Ryan Harris played on the album, another former NPG member, Sonny Thompson will join Nick & The Administration on tour. Fans can catch a glimpse of their dynamic performance on the Grammy Nominations Concert Live! Special airing Wednesday, December 2 on CBS at 9PM. S-Curve recording artist Diane Birch will be the featured special guest (www.dianebirch.com). Diane’s critically acclaimed debut album, ‘Bible Belt’ is in stores now. Many of you have been asking for our reviews on Apps for Twitter. We have reviewed many Apps and have come with our own conclusion for the best and worst Apps for Twitter. Stay tune as we review more products you have sent us to review. We are in the process of making a new page which will be called “Reviews.” As we review Apps for our social networks, iPod and iPhone skins, to best cell phone. Keep requesting what you want us to review and we will as soon as we can! 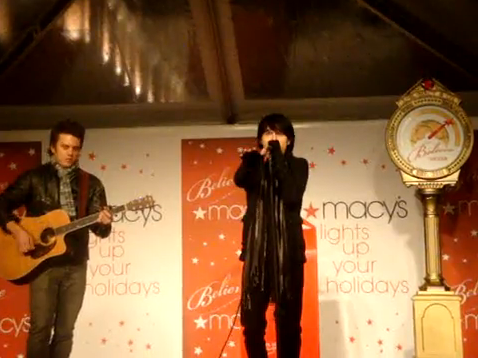 Exclusive footage of Mitchell Musso performing an acoustic version of “Shout It” and “Jingle Bell Rock” at the Macy’s tree lighting ceremony in Boston, MA. What do you guys think of Mitchell’s music? Selena Gomez and The Scene ended their House of Blues tour at the House of Blues in Selena’s hometown: Dallas, Texas. Selena and her band have come along way and we can’t wait to see what they have in store for their 2010 tour! What do you guys think of Selena and her band so far? Selena Gomez teamed up with Radio Disney to bring her Disney Channel fans closer to her “House of Blues” concert tours with Radio Diesney’s Total Access. Watch as Selena and her band rehearse and as they bring their concer to life with hundreds of fans jumping to their music. Keep a close eye on the fourth clip and you’ll be able to see us in the video! Taylor dropped by Lopez Tonight on TBS on Thanksgiving. The New Moon actor reunited with his Sharkboy & Lava Girl co-star George Lopez. If you missed the interview here are the clips.